Children’s ideas of death and resurrection often surprise us. TV legend Art Linkletter once had a TV show highlighting the funny things children say. One of his funniest stories was about a seven-year-old boy whose dog had died. Right. No dead things in heaven. The truth is, God is all about giving life. We celebrate that truth on Easter; we celebrate the resurrection. Cute, but not true. Jesus didn’t sneak out of the grave. Our Lord emerged triumphant over death, and showed Himself to hundreds of people in 12 appearances after His resurrection! He appeared to Mary Magdalene (Mark 16:9; John 20:10-18). He appeared to the women returning from the tomb (Matthew 28:9-10) and to the two disciples on the road to Emmaus (Luke 24:13-32; Mark 16:12-13). He appeared to Simon (Cephas, or Peter) in Jerusalem (Luke 24:34; 1 Corinthians 15:5). He appeared to the disciples and others in a locked room in Jerusalem ~Thomas not being present (Luke 24:36-43; John 20:19-23). A week later, Jesus appeared again to His disciples, and Thomas saw Him (John 20:24-29). He appeared to seven disciples at the Sea of Galilee (John 21:1-24), and to 500 believers at one time (1 Corinthians 15:6). He appeared three more times to various disciples (1 Corinthians 15:7; Matthew 28:18-20; Luke 24:50-53) before His ascension to heaven ~ and then to Paul after the ascension! (Acts 9:3-6; 1 Corinthians 15:8). 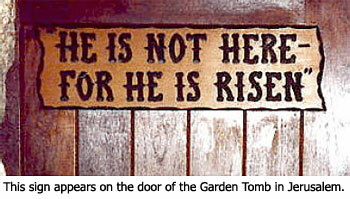 The wonderful consequence of Jesus’ resurrection for us today is this: because He lives, we too shall live (John 14:19). Jesus’ resurrection was more than an event. In John 11:15, He said, “I am the resurrection and the life…” He is the resurrection. He is the way, the truth and the life (John 14:6) ~ the only way to live forever with God. Christians who are blood-bought and in Christ are heaven-bound, eternal creatures. The glorious truth is, Death cannot hold us down. Easter ~ The Rest of the Story and then Some! You’re likely to see a lot more people in church on Easter Sunday… well, maybe. Radio personality Paul Harvey often surprised his listeners with a surprise “twist” on his stories, saved until the very end. Broadcasts concluded with the warm tag line, “And now you know … the rest of the story.” Though the folksy storyteller died in 2009, his tag line will live on in the minds of those who loved him; and his book, Paul Harvey’s the Rest of the Story, includes 82 tales with the punch line that makes us smile. I (Dawn) read a post by my friend Lynn Mosher recently that got me thinking about not only the resurrection of Christ, but events following that miraculous day. Lynn wrote, “Who removed those gruesome nails from Jesus’ body?” It was something I’d never thought about. Of course, someone had to take down Jesus body for burial … and it was likely Joseph of Arimethea who extracted “the bloody nails driven for the sins of man.” It made me wonder what other things I might not have considered. Actually, as I’ve thought about Easter this year after visiting Jesus’ tomb in Jerusalem, I’ve dug deeper than ever before into the facts surrounding His death and resurrection. I’ve been spurred on by my friend, Nancy Leigh DeMoss of Revive Our Hearts. I followed her broadcast series, titled “The Incomparable Christ” ~ an expansion of the chapters in the book by the same name, authored by Oswald Sanders. As an Easter devotional, I wanted to share some of Nancy’s thoughts from that series. “There is no way to overstate the importance of Jesus’ resurrection to the 1st century followers of Christ,” she said. “Before the resurrection, they were timid, fearful . . . the thought that their lives might be at risk caused them to run for cover . . . and then, the news of the resurrection, along with the empowering of the Holy Spirit, transformed those first disciples into a bold band of believers who were willing to lay down their lives for Christ’s sake. The Church was birthed and spread through the proclamation that Christ died for our sins and was raised from the dead. Nancy then shared Seven implications of the Resurrection for those who have placed their faith in Christ. The Resurrection means there is hope in the most desperate circumstance.